We’ve all been there, but the shift in expected rarity is just a real kick in the teeth. Ouch. 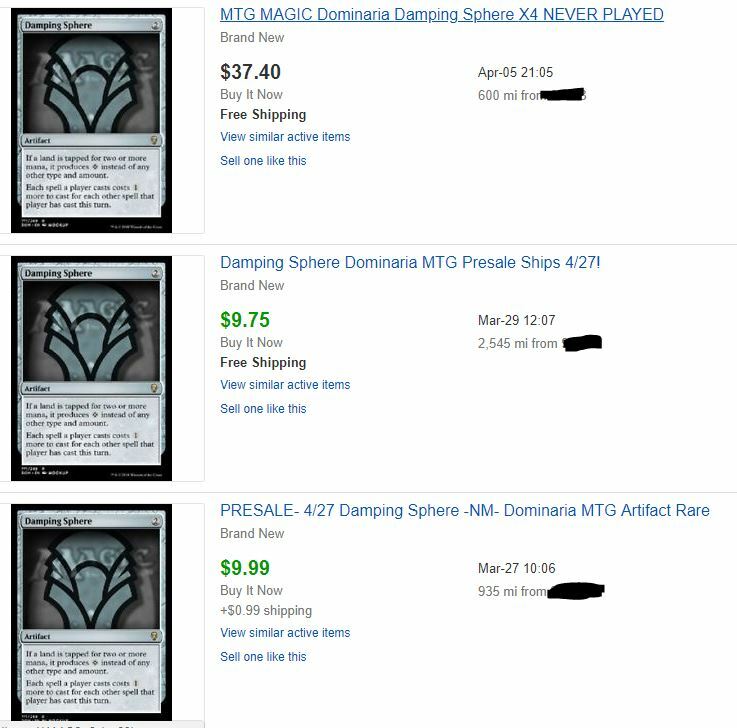 Someone paid $40 to preorder a set of four uncommons right before the set came out. With the Sphere weighing heavily on my mind, I want to look at something unusual Wizards has been doing lately: printing powerful, and therefore valuable, uncommons. We had a few in Kaladesh block, but Ixalan kept it going and now it’s a full trend. Wizards has announced that they are going to go back to printing Standard-legal cards as FNM promos, and I don’t think they are going to start messing with rares in that space. I could be wrong, but I’m proceeding with last known information, such as Unlicensed Disintegration, Fatal Push, and Aether Hub. Lock it down: We are going to get promo versions of Ravenous Chupacabra, Field of Ruin, Damping Sphere, and Seal Away. 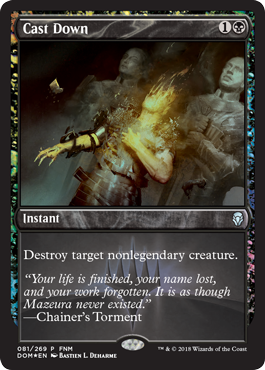 Wizards has already given us three promos to be given out during the three months of Dominaria: Opt, Shanna, Sisay’s Legacy, and of course Cast Down. I miss the textless cards but I dig this new frame. I want to buy Cast Down at ~$2 each. It just packs such a punch in Modern that it needs to be considered. It’s one more mana, but I went scouring lists and I could come up with four Legendary creatures seeing a notable amount of play: Thalia, Guardian of Thraben, Vendilion Clique, Tasigur, the Golden Fang, and Baral, Chief of Compliance. There’s a few who pop up here and there, but you’re more likely to see an Ornithopter than a non-Thalia legend. I don’t think that Cast Down is the next Fatal Push. I want to be clear about that. Push has been a powerful card precisely because it’s a single mana. Going up to two is a significant cost but you’re going to see some mix of Push and Cast Down in Modern, and $2 seems cheap for a card that is going to have immediate impact in Modern. The impact in Standard is real. Black decks are so stacked right now, the removal is so good, here’s a sample curve for mono-black. Turn 4: Ravenous Chupacabra, which kills almost everything in Standard anyway. That’s where I would start, and I’d absolutely be maindecking at least two Golden Demise to deal with these pesky token decks. Duress is still there too, don’t forget. NONE OF THOSE ARE RARES. Don’t want to Walk the Plank? The world is your oyster. Never // Return. Vraska’s Contempt. Moment of Craving. Impale. Doomfall. Trial of Ambition. Bontu’s Last Reckoning. And don’t forget Arguel’s Blood Fast to keep your hand stocked. Maybe a Tetzimoc, Primal Death to end the game. Doesn’t really matter. Back to my original point: Cast Down is really really good and will be more than the $2 preorder, but if you want to hold out for the FNM copies, I won’t blame you. If you didn’t read Wizards’ post, note that stores aren’t going to give out a single promo per month. They are given the three promos in a big stack, and will give out the promos as they see fit. There’s not going to be a month where Cast Down gets cheap because EVERYONE gets one. It’ll be a steady current of additions. I feel good about Seal Away at about $1. You have to wait for someone to attack with it, and it’s less proactive than Baffling End, but a set at $4 right now will save you a few bucks. I don’t expect this to impact Modern at all, be warned. I feel good that Cast Down will be $5-$7 at Christmastime, but Seal Away will plateau at $2. Damping Sphere is a card I want to love. As I mentioned at the beginning, it’s a super-powerful card against a range of strategies, but the additional cost to play extra spells hits both players. You can’t just slam it in your deck and get them. Don’t overlook how good this is against Burn, though. It’s got game against decks that want to flood the board with creatures, too, but it’s pretty darn lame against Aether Vial. Hollow One decks don’t much want to see this card, but that deck is capable of having 12 power in play on turn one. Right now the Sphere is preselling for $5, and that’s a price where I’m not going to make any money for a long time. If it’s not reprinted, it’ll see enough play to eventually creep above that, but the initial supply is going to be big, plus the likelihood of a promo version. Modern decks aren’t going to all pack a playset of this, either. I’ll be hoping to get this in the $3 range at the end of summer. We’re 1000 words in and I haven’t even mentioned Sagas, or the Memorial cycle of lands, or the new Black Knight and White Knight. That’s a low of power, and a lot of value, crammed into the uncommon slot, and we’ve had this in enough sets in a row to make it sort of official. I’d be interested in knowing what the rationale is behind this change, but I’m all for more $1-$2 (and more) uncommons!